Boss John Hughes asked fans who booed his Hibernian side after the draw with Hamilton to put things in perspective. He said: "I can understand it, but it's disappointing. Maybe they think we're better than we are, maybe that's the problem. Maybe it's the expectations. 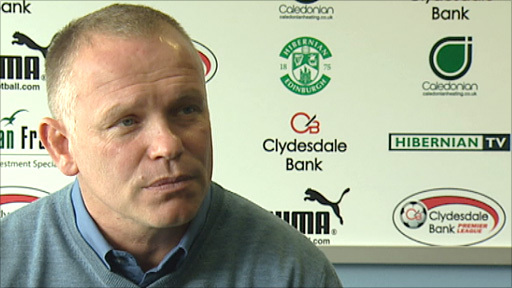 "Maybe we punched above our weight last year (when Hibs finished fourth). "If they have a good look at what's gone on at this club and they know their football then the answers are staring them right in the face." For the second week in a row, Hibs took the lead through a Derek Riordan goal but ended with a 1-1 scoreline. "I felt that we put enough into it to win the match," said Hughes. "I have to say that the quality wasn't good enough to win the football match. "I've seen the crossing better and the passing better. But, in terms of application and what they're trying to do, they're trying to do it right. "One or two of them might be lacking confidence. You bring that on yourself, you need to rise above it. "We've asked Derek to play centre-forward and he's got a couple of goals now and he's unfortunate not to be on the winning side. He's got that in his locker - he hit a ferocious free-kick as well. "I felt there were other wee things going on at the edge of the box that we could've really capitalised on. "We just need to regroup and go again." The result extends Hibs' winless run at home, which stretches back to March. "If that's punishment for success then I'll take it every year," added Hughes. "Albeit, in the last couple of weeks we've played Inverness and Hamilton, but you're talking about Rangers twice, Celtic, Maribor, Hearts. You're talking about all the top teams. "If it's the same next year, I'd be absolutely delighted."